According to the leaked mobile roadmap slide, AMD plans to begin 28nm production for the fourth quarter of 2011 with the plausible launch in late 2011 or early 2012. Chelsea is a 128-bit Chip while Thames will feature twice the performance as Seymour (Radeon HD 6000M). Higher end GPUs will also see a refresh. However, those will not be made using 28nm technology. 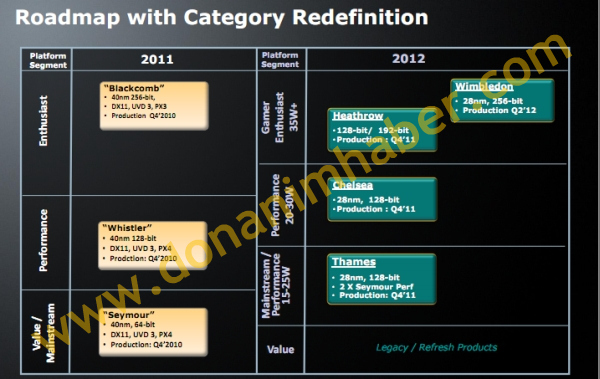 Instead, Heathrow (which is also set for Q4 of 2011) will feature 128-bit and 192-bit versions while it’s wiser, 28nm brother codenamed Wimbledon will launch in Q2 of 2012 (as we reported earlier).